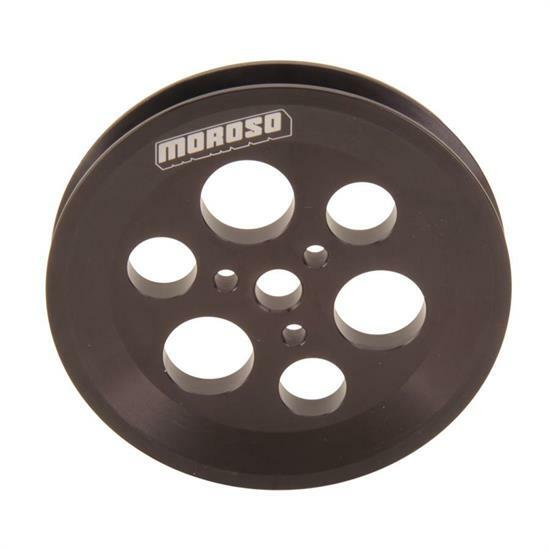 Moroso 64885 Vacuum Pump V-Belt Pulley is 5 inches in diameter and uses a stock 3 bolt mounting pattern with a 1.16 inch bolt circle. Constructed from high grade aircraft aluminum, these pulleys feature an anodized finish to help extend service life. The deep V-groove will ensure belt retention no matter the racing conditions. This V-Belt pulley will fit Moroso Vacuum Pumps 22640 or similar "smog" pumps that feature an OEM-style 3-bolt mounting system.